After loads of talk behind the scenes that Anthem faced a troubled development cycle, the end product seemed to bear out that idea. Anthem’s story seems altogether disconnected from how it plays, and while all the flying around and shooting is fun at its core, the game is the worst-reviewed in BioWare’s history. 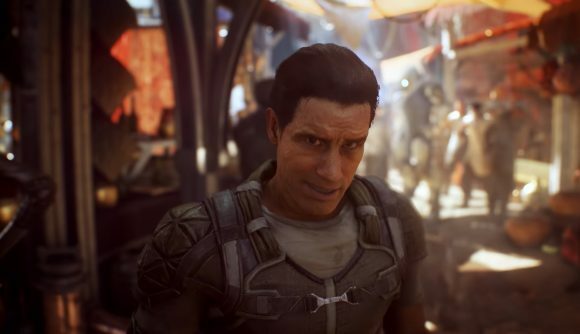 A lengthy new report on the game’s development breaks down what went wrong – and explains many of Anthem’s most egregious problems. Kotaku’s Jason Schreier spoke with 19 people who worked either on Anthem or close to it. The full article is well worth your time, but even just a cursory skim reveals that the team never really had a cohesive vision for what the game was meant to be. There’s a belief at the studio called the “BioWare magic,” which suggests that even in the most distressing development cycle, the game will still work out in the end. That turned out to be true with Dragon Age: Inquisition, but less so with Mass Effect: Andromeda – and now Anthem has former believers in that magic rethinking their approach. EA’s cross-studio push for its Frostbite engine also caused issues, just as it had on previous BioWare games, which made it difficult to implement the game’s original planned features or quickly make design changes. On top of that, BioWare engineers with experience in the engine were occasionally, early in development, being pulled off Anthem to assist with Frostbite development on games like FIFA. Another developer says “Reading the reviews is like reading a laundry list of concerns that developers brought up with senior leadership.” Those issues were, in Schreier’s description, “brushed off.” The Tombs of the Legionnaires challenges, for example, were implemented specifically to lengthen the game’s limited content. A pair of devs report that early designs for that mission even included time gates that would make players wait days to complete it. The most concerning problem, of course, is the toll Anthem’s development took on the people making the game. Many devs took doctor-mandated ‘stress leave’ for weeks or months at a time. One developer says “I’d never heard of ‘stress leave’ until the end of Andromeda,” and it only got worse during Anthem.